When light travels through a liquid at an angle, it bends -- or refracts -- slowing down and changing direction as it travels through a new medium. This phenomenon can be used to measure the concentration of a liquid solution, as light refracts more when traveling through suspended solids, such as salts or sugars. Using a tool called a refractometer, an index of refraction can be measured for a liquid and assigned a value on the Brix scale. As light bends while passing through a liquid, the refraction can be measured on the Brix scale. 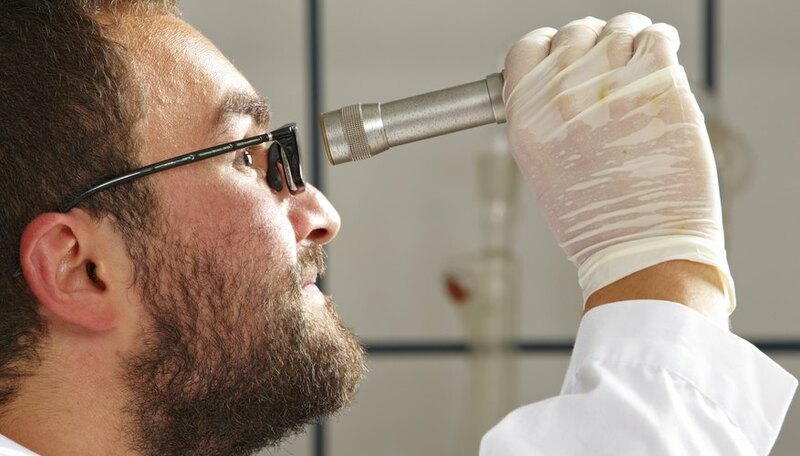 The resulting reading from a refractometer is assigned a value on the Brix scale, making it easy to compare different concentrations in solution. Pure water with no suspended solids has a Brix value of zero, while water with sugars, minerals or other solids in solution refracts light to produce a higher Brix value. Refractometers are easy to use and are sold as either analog or digital handheld devices for use in the field by scientists, farmers and even students. Both analog and digital refractometers work on the principle that light moves more slowly in more concentrated solutions. When the light slows down, it also changes direction and changes the reading produced by the refractometer. An analog refractometer requires no external power source to function. To obtain a Brix reading for a solution, a few drops are placed on top of a prism, which is then covered by a lid. The refractometer is then brought up to the observer's eye and held perpendicular to a light source. Light is refracted through the liquid, and a Brix reading is taken where the light and dark areas meet on the scale, as demonstrated in the University of California Cooperative Extension's manual on refractometer use. Digital refractometers produce their own beam of light from an LED, instead of using daylight or another outside source of light. Once the liquid is placed inside the receptacle, the light is beamed through the sample and the computer assigns the resulting refraction a numeric value based on the Brix scale. The final value is then displayed on a digital screen. Echolls, Taylor. "How Does a Refractometer Work?" Sciencing, https://sciencing.com/refractometer-work-5314561.html. 24 April 2017.